In the end, do you stand and recognize the man, the deed or the uniform? Do you stand and applaud the player or the 24 beside him, who wear the same uniform, who foremost needed a hit to beat the Detroit Tigers and a win toward a return to October for the first time in three years, an eternity for the storied franchise? Do you rise and forgive? Forget? Do you rise for the moment? Is it your duty as a fan of the New York Yankees, like your father was, and his father too? Are you simply exhausted by the controversy? The shade it throws? The column inches it inspires? Or do you just want a cool selfie? A pariah just months ago, when his life choices fouled his career choice, embarrassed his team and his sport, and ostensibly held up the Yankees' return to relevance, Alex Rodriguez homered on the first pitch he saw from Justin Verlander for his 3,000th career hit Friday night at Yankee Stadium. The grand place shook with gratitude. It roared with approval. Rodriguez had picked out a first-pitch fastball – 95 mph, middle-middle – and drove it into the right-field bleachers. For 360 feet he did his best to stifle a smile, the last 90 past a stoic Detroit Tigers bench. When he reached home plate, Rodriguez tapped Tigers catcher Bryan Holaday on the shoulder, then fell into the embraces of his teammates in front of the dugout. When the crowd would not settle, Rodriguez leaped up the stairs to the field, waved to the people, then flipped an excuse-me wave to the waiting Verlander – a curtain call, whadda ya gonna do, huh? He'd joined 28 others at 3,000 hits, even homered just like Derek Jeter had. 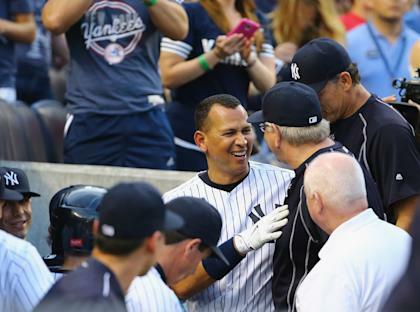 The on-again, off-again relationship between the prodigal A-Rod and pinstriped New Yorkers is most definitely on, a connection that in its lifespan we've seen to be willful but temporary. Yankee fans don't generally suffer the inept, the distracted or the foolish, tendencies toward which A-Rod occasionally leans. The most forgiving among them – among any of us, really – could not, however, have expected a capable and competitive Rodriguez in 2015 or, perhaps, ever again. He was a year-and-a-half between real at-bats, that much further toward his 40s, a-wobble on graham-cracker hips, summer-love knees and a reputation more brittle than either. From where he'd been, there was, he knew, only one way back: He would have to hit. Then the Yankees would have to win. And then the American League East would have to help. Maybe it was a lot to ask. Rodriguez, however, awoke Friday morning with 12 home runs, 34 RBI, a .278 batting average and an .888 OPS, not his best but his best in six or seven years, and behind only Mark Teixeira among Yankees run producers. The Yankees themselves were 36-30, not a juggernaut, but OK in the newer, softer AL East. He also awoke with 2,999 career hits, one lousy line drive or hard grounder or bloop or very long fly ball from the magical 3,000, except we sort of know where at least some of the magic came from. Not from magic. Once, a long time ago, considered the antidote to Barry Bonds, Rodriguez lives the Bonds-ian life – adored in his whites, despised in gray, in a category where the statistics aren't necessarily a reflection of the man. If attitudes hold, Rodriguez, one of the top 10 or 20 ballplayers ever, is not playing for Hall of Fame votes. He is not playing to forge his place in history. What's left is the game, the at-bat, a hittable fastball. The self-effacing joke. The event outside Yankee Stadium on Thursday that encouraged boys and girls to play more baseball, in which commissioner Rob Manfred and Rodriguez, once at each other's throats, shook hands. Just, the rest, whatever it brings – clean, happy, healthy, productive, remorseful and heroic to his daughters. There were many who believed these occasions – the home run that passed Willie Mays, the 2,000th RBI, Friday night's hit – would not come for Rodriguez, and certainly not as a Yankee. If, for some reason, they did come, it would be before crowds with folded arms and held tongues. After all, he'd come clean before, apologized before and then, if we have our timeline right, met a guy who knew a guy. Instead, the people cheered for Alex Rodriguez. The night before, they'd scalded the pitcher who'd had the gall to pitch around him. The people wanted to see it, to feel it, to celebrate it. Maybe they've forgiven him. Maybe they've simply chosen the man over the organization that turned on him (after he turned on it). Maybe they're just over it, the whole mess, because in the end he is just a ballplayer and this is just a ballgame. Maybe they just wanted to win that.